Options Under 60 lbs. - 84 ct. 60 lbs. and over - 84 ct. with MSM - under 60 lbs. - 84 ct. with MSM - 60 lbs and over - 84 ct.
Age is nothing but a number thanks to Dasuquin Soft Chews for Dogsmedicinal treats that ease the pain and discomfort associated with osteoarthritis in dogs. When used according to the dosage instructions, the tasty treats promote joint health and get dogs up and moving. 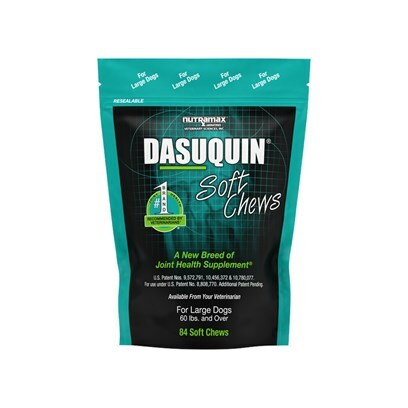 Dasuquin Soft Chews for Dogs are available for dogs of all sizes. There are no known side effects, though dog owners should be careful not to over-administer this or any other medication or medicinal treat. There are no known adverse drug reactions to Dasuquin Soft Chews for Dogs, but you should always be sure to notify your veterinarian of any other related medications or supplements your dog is currently taking. Initially, over a period of 4-6 weeks, dosage is recommended at 2 chews per day. Over time, as your dog’s comfort and mobility improves, suggested maintenance levels are 1 chew per day. The maintenance level can be used long-term on healthy dogs to help support their joints. An individual dog's needs may vary. Dogs on a maintenance level can be increased to the initial level as needed, for example, on weekends or other times when they are more active to provide support to the joints.